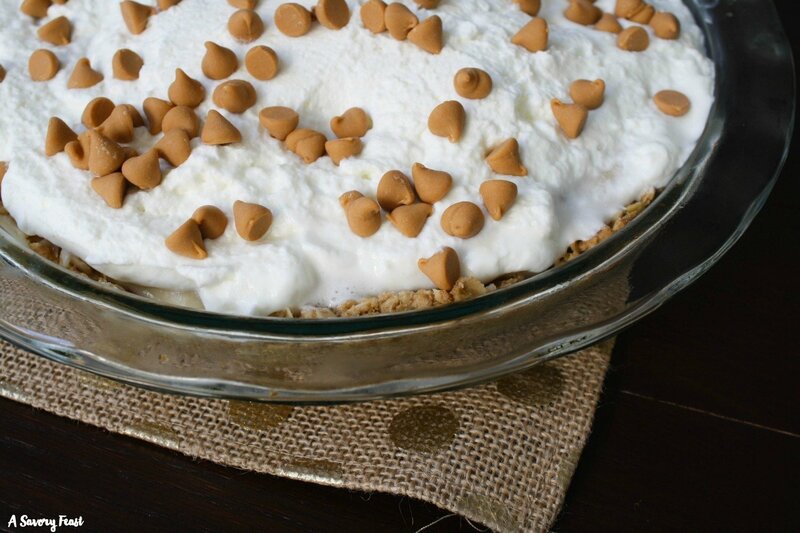 This Butterscotch Pie with Oatmeal Crust is made from scratch, but don’t let that scare you! It starts with a simple oatmeal crust. Homemade butterscotch pudding comes next, topped with a super easy whipped cream and butterscotch chips. Your Thanksgiving menu just won’t be complete without this dessert! Today I’m excited to participate in Wayfair.com’s second annual Battle of the Pies! 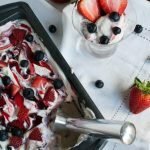 I’m one of 20 bloggers selected to share a creative pie recipe. I’m hoping to win with this delicious Butterscotch Pie! 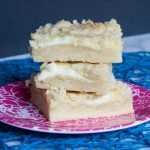 My husband is a huge fan of butterscotch, so that’s my go-to when I want to make a special treat for him. One of his favorites is my Butterscotch Oatmeal Cookies. Since I knew that butterscotch and oats go together so well in that recipe, I came up with a pie recipe using the same combo. 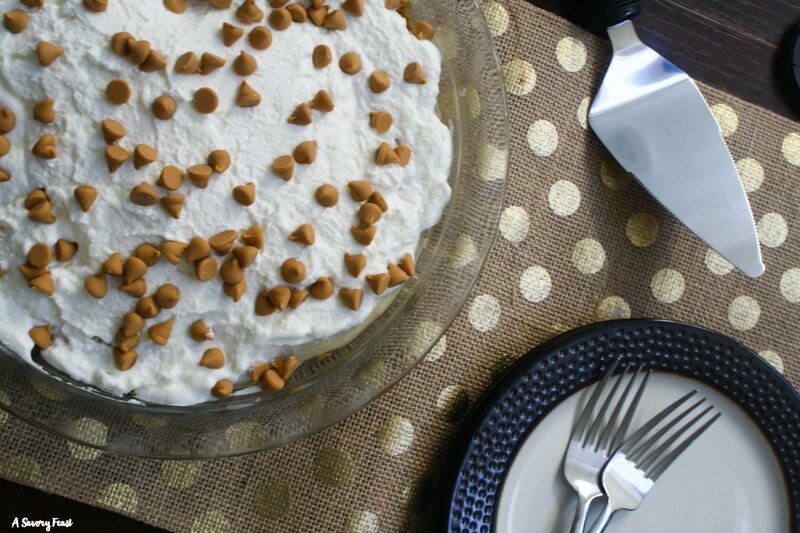 I’m adding this Butterscotch Pie from @aSavoryFeast to my Thanksgiving menu! The crispy, homemade oatmeal pie crust goes perfectly with the creamy butterscotch pudding! I’m looking forward to trying this oatmeal pie crust with more recipes in the future. It would be great with any cream pie. After the crust and pudding layers comes a sweet whipped cream that’s made from scratch. It only needs two ingredients and can be whipped up in a couple minutes! Can you believe that Thanksgiving is just a month away? 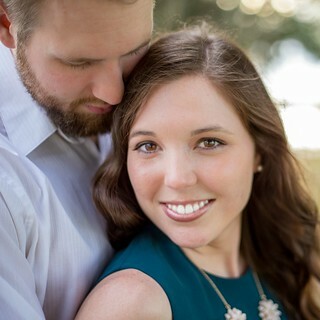 It’s time to start planning! Whether you are hosting or just bring a dish, this is one recipe you’ve got to make! It’s guaranteed to be a hit. Wayfair has lots of great items to help you with all your Thanksgiving baking, cooking and decorating. 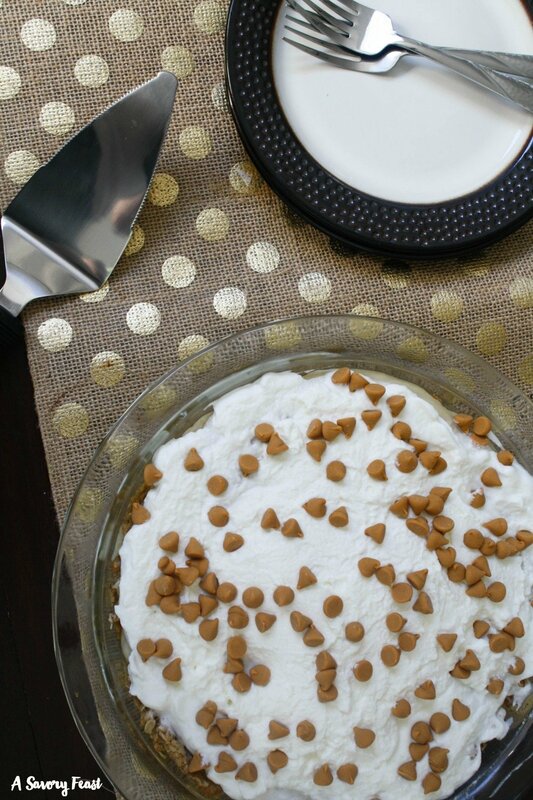 I used this Pyrex Pie Pan for this recipe. For mixing up the crust, my Pyrex Bowls were perfect. 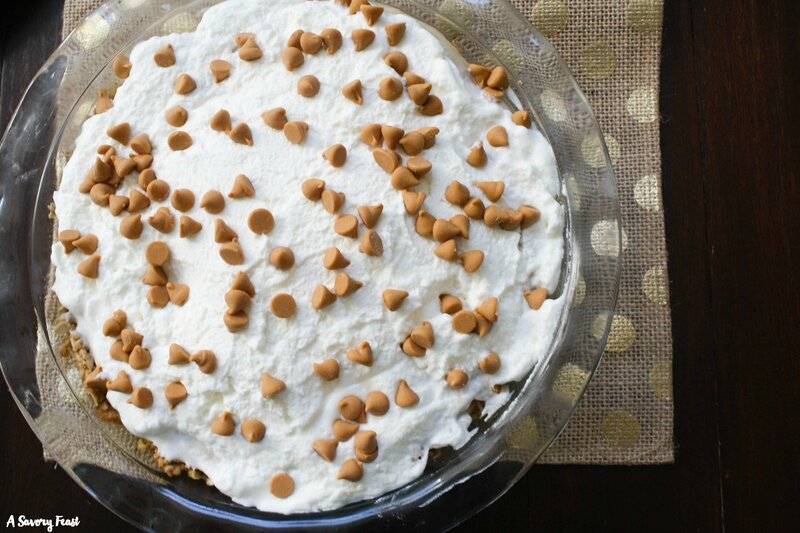 This Butterscotch Pie with Oatmeal Crust is made from scratch, but don't let that scare you! It starts with a simple oatmeal crust. Homemade butterscotch pudding comes next, topped with a super easy whipped cream and butterscotch chips. Your Thanksgiving menu just won't be complete without this dessert! Preheat oven to 375 F. Grease a 9-inch pie pan. Mix together the oats, flour, brown sugar and salt. Use a pastry cutter to cut in the fold butter until the mixture is crumbly. Press into the pie pan so that it covers the bottom and sides of the pan. Bake for 13-15 minutes or until browned. Use a spoon to press the crust down. Let cool completely. In a large saucepan, stir together the brown sugar, flour, cornstarch and salt. Place onto the stove over medium heat and slowly add in the milk. Stir constantly until it begins to thicken. In a small bowl, lightly beat the egg yolks and then temper them by adding in a little bit of the hot mixture and whisking together. Stir the egg yolks into the hot mixture and add in the butter and vanilla. Let cook for a couple more minutes. Pour the mixture into a bowl and place in the fridge to cool completely. Once the filling and crust are both cooled, spread the filling into the crust. Make whipped cream by beating the heavy cream and powdered sugar in a mixer. Spread the whipped cream on top of the filling. Sprinkle with butterscotch chips to garnish. Keep in the fridge until you are ready to serve. What is your favorite type of pie for Thanksgiving? Yum! This looks so good. I need to start seriously thinking about our Thanksgiving menu. This just might need to make an appearance! 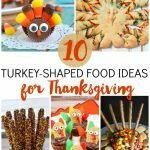 You should SO make this for Thanksgiving! I love the crust you’ve used for this! I’ve never used oatmeal in a crust before but what a great idea. 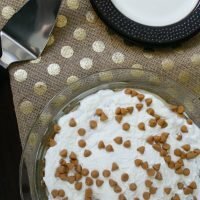 Your Butterscotch Pie looks amazing – wish I could grab a fork and just dive in! Thanks! An oatmeal crust is great for cream pies. It adds a nice crunchy texture. I love butterscotch flavors. The oatmeal cookie crust is definitely a great pairing! Oatmeal and butterscotch is a delicious combo for sure! What a great combination! Butterscotch and Oatmeal cookie crust. Very nice! I am a big fan of oatmeal and butterscotch together! Good old-fashioned butterscotch is so comforting and delicious! This pie looks amazing, and that crust sounds great! For sure! The butterscotch pudding part of this pie is made from scratch so it’s extra good. I can’t believe that Thanksgiving is only a month away. It’s definitely time to start planning the menu. Thanks for sharing your pie. This pie would be a great addition to your Thanksgiving menu. Happy planning! This pie is so pretty! Can’t wait to try it! Thank you! I think you will enjoy it. This sounds sooo good. I like my pies to taste like candy instead of fruits, so this is right up my alley! Pies that taste like candy are the best kinds! That oatmeal crust looks AMAZING. It’s such a great idea! Just like crunchy and sweet, yum! I just LOVED how the oatmeal crust turned out! I can’t wait to use it for other cream pies in the future. I love the sound of this oatmeal crust! And the filling – to die for! YUM! Oh that crust was SO good! It went so well with the butterscotch filling. 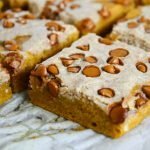 Butterscotch has always been one of my favorite hard candies, so the idea of it in a pie, sounds amazing to me! I love butterscotch, too! It was the perfect flavor for this pie. 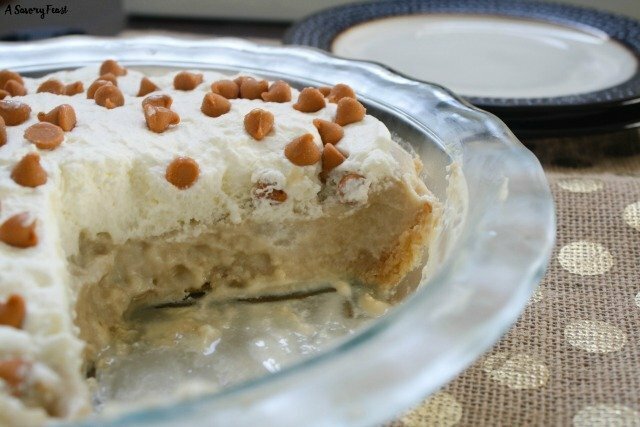 I just love a Butterscotch Pie, this looks delicious. I pinned it to make later. Thanks so much for sharing with us at Full Plate Thursday and come back soon! Thank you Miz Helen! I hope you get a chance to try it soon. This sounds delicious! I love the oatmeal crust. I need to try it for sure! My great-aunt always made butterscotch pie for dessert when we ate dinner at her house and it was fabulous. I’ve never made one myself, so I’m definitely saving this one for later. I think you will love this version! The oatmeal crust goes so well with the butterscotch flavor.